We have a confession to make: years after the movie came out, Chocolat is still high on our list of favorite films of all time. Who doesn’t love a movie featuring a gypsy-clad Johnny Depp and chocolate? One of our favorite scenes is the dinner party. We love the effortless Bohemian style of the affair: the beautiful colors, the dripping candles, and the massive amounts of delicious food. 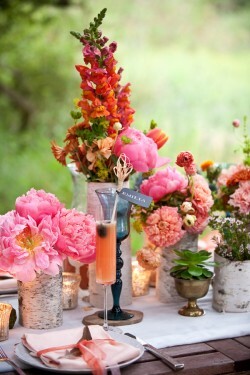 We had a lot of fun imagining a wedding that pulls on this scene for inspiration with a modern touch. We hope you enjoy! 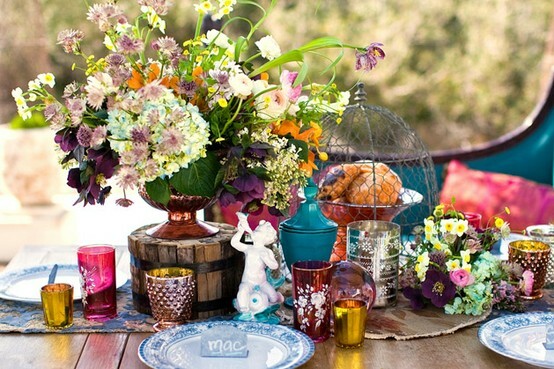 One “must” for a Bohemian wedding is COLOR. Think vibrant, beautiful draped fabrics! 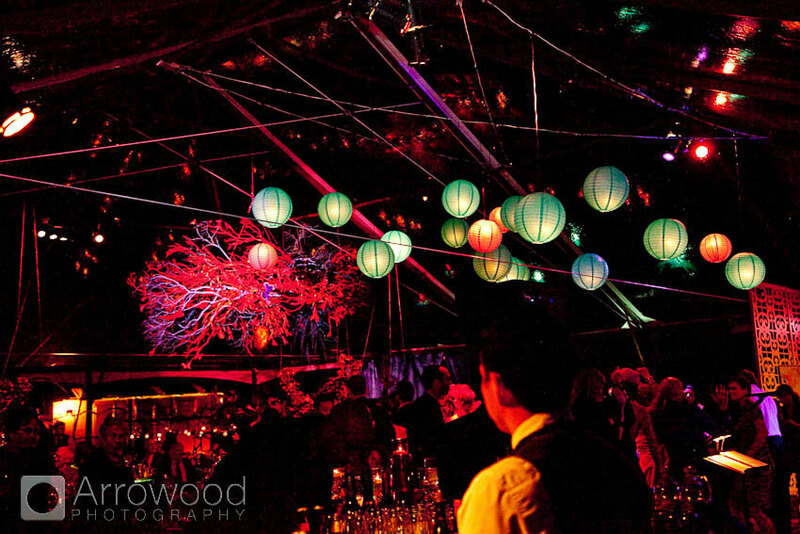 Lighting is also key: dripping candles set the scene at the tables, while fun globes light overhead. 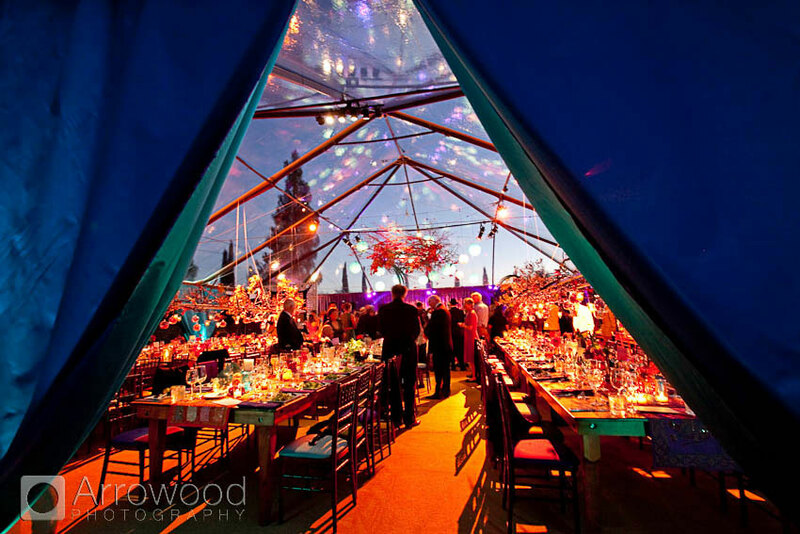 How about a clear tent to let the moon and stars shine down on your night, now that’s stunning. 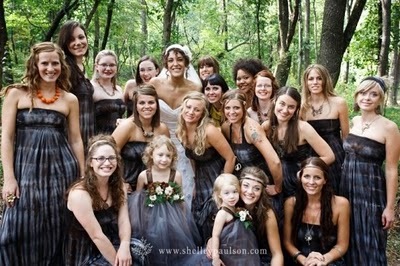 Balance the colorful décor with romantic, flowing bridesmaids dresses in soft, neutral colors like tan, brown, or black. 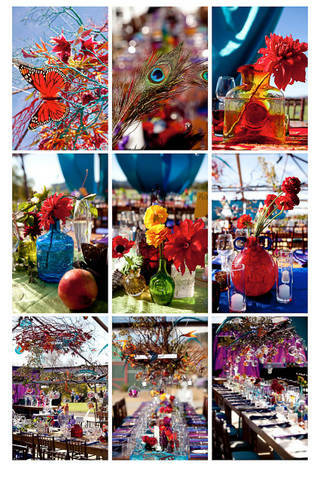 The dresses work as a blank canvas for beautiful, colorful bouquets, accessories like fun hairpieces. Serious about going Boho? 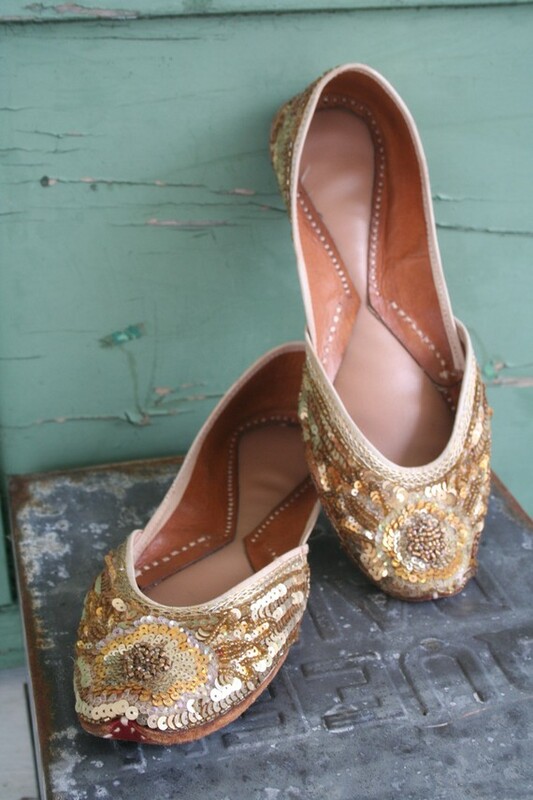 Have fun with beaded slippers: they are a million times more comfortable than any heels and certainly more fun! A bohemian bride MUST wear flowers in her hair. 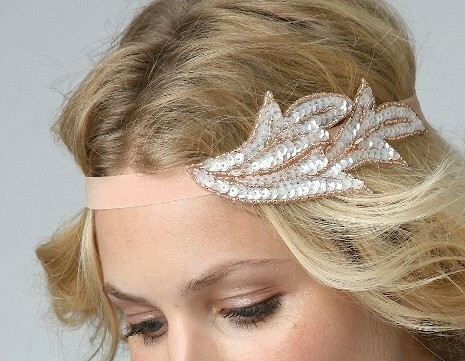 Or, take it a step further and use one of the halos that are quite popular at the moment. 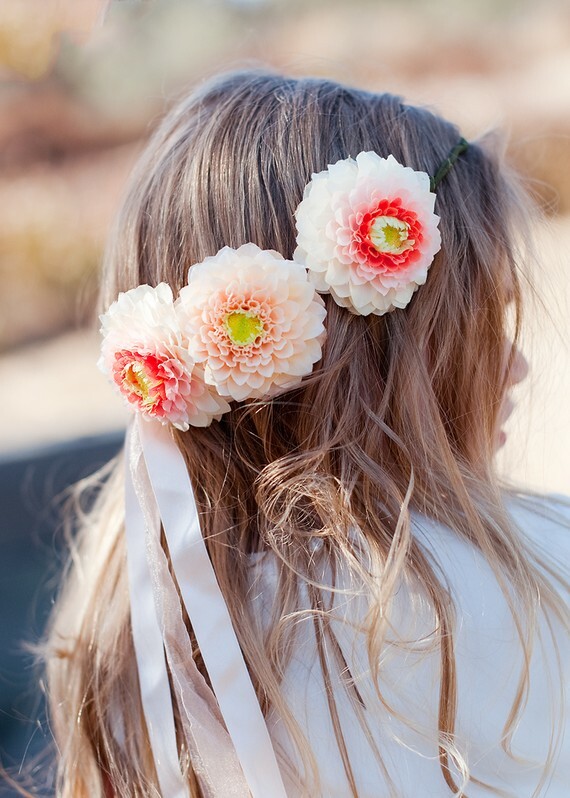 Don’t forget about a fun fair accessory for the flower girl! 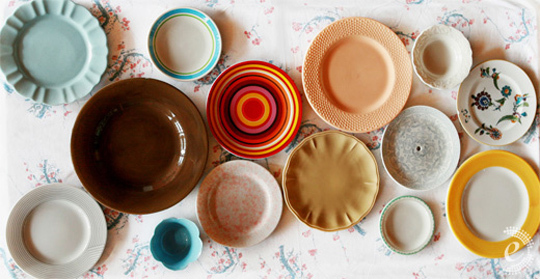 A mismatched hodgepodge of dinnerware completes the effortlessly beautiful theme. Incorporate as much greenery as possible to continue the natural, bohemian feel. 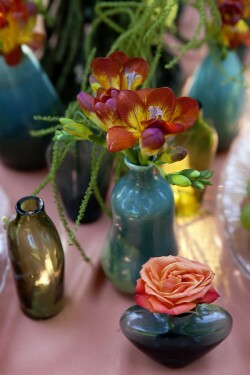 Or, keep the dinnerware simple and mismatch vases full of colorful flowers for a fun centerpiece. 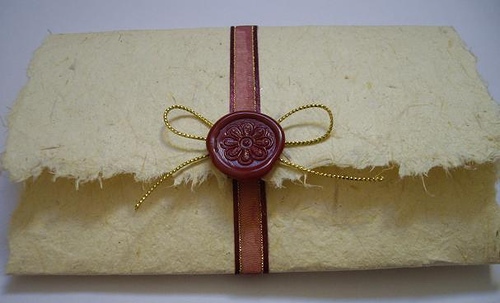 Invitations and menus printed on handmade paper give a beautiful, rustic touch. 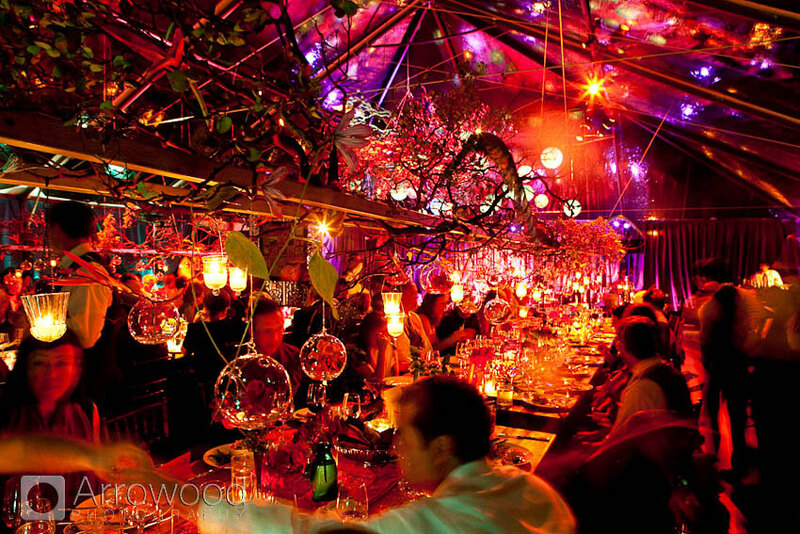 Of course, as in the movie Chocolat, food is key at a Boho event! We imagine heaping family-style dishes of plates like the shrimp passed around in the movie. Plates of vibrant grilled vegetables, salads, and pastas being passed around is a sure-fire way to get guests mingling and comfortable. And Boho is ALL about effortless comfort!